In the digital marketing world a lot of effort has been invested in the making and promoting of content with a singular emphasis on marketing ROI. But customers don’t care about your “great content”, your “clever marketing” or how much money you make from trying to sell them something. What do customers care about? Much has been said recently about consumers and experiences vs. things. According to a Harris Poll/Eventbrite study, 78% of Millenials would choose to spend money on a desirable experience or event over buying something desirable, and 55% of millennials say they’re spending more on events and live experiences than ever before. So how can businesses adjust and adapt to creating more meaningful experiences for their customers? How can companies be more relevant and meaningful about how they make customers feel? 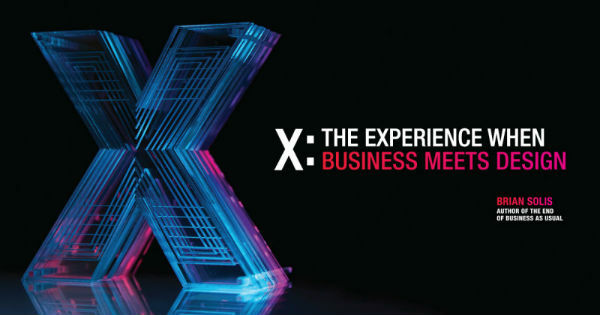 The new book by my friend, Brian Solis, X: The Experience When Business Meets Design may be your answer. For context, I’ve know Brian Solis a long time from back when he had a Public Relations agency during the early days of social media. It has been impressive to follow his thought leadership journey, writing multiple books, rubbing elbows with celebrities like Shaquille O’Neal and Fortune 500 CEOs, keynoting events all around the world, and arriving at his role as principal analyst, working with Charlene Li at Altimeter Group, a Prophet company. As a digital analyst and anthropologist, Brian is prolific to say the least with consulting, blogging, writing books and events. That’s why when his publicist reached out to ask me to review X, I replied that I had already ordered a copy. X is a tactile, visual and an intellectual experience all on it’s own. The book has weight, the extensive graphics pop and the organization is very app-like and digital, even though it’s printed on paper. The content of X is equal parts inspirational, cerebral and entertaining, which is fitting, because that’s how I would describe Brian too. My entree to the social media world was greatly influenced by my interactions with Brian and through our interactions, interviews and his content, I have been inspired and my imagination has been triggered in many ways. Close your eyes for a moment and think about the last time you truly had a great experience with a company as a consumer, an experience that captured your heart, mind and spirit. What about it was special? 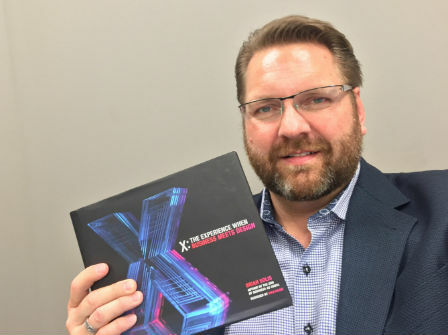 This book is about X, creating such memorable moments for your customers through every encounter they have with your brand – all day, every day. What is X about? It’s about why the future of business is experiential and how brands can create and cultivate meaningful experiences for their customers. We live in an always-on world where everyone is connected to information and also, to one another. In this environment, customer experience is your brand and X is literally a blueprint for brands to start delivering better experiences. What can you expect to learn from reading X? How our own experience gets in the way of designing for people not like us. Why empathy and new perspective unlock creativity and innovation. The importance of User Experience (UX) in real life and in executive thinking. The humanity of Human-Centered Design in all you do. The art of Hollywood storytelling from marketing to product design to packaging. Apple’s holistic approach to experience architecture. The value of different journey and experience mapping approaches. Once you buy and read through this book, resist the temptation to exhibit it’s beauty on your coffee table, and use it more like a blueprint or manual for innovating your business to be experience focused. “A mind that is stretched by a new experience can never go back to its old dimensions.” Oliver Wendell Holmes, Jr.
Of course, the experience of reading this blog post is no match for the real-world experience of the book itself. I highly recommend you grab a copy of X from one of the links below. By Brian Solis, a digital analyst, anthropologist, and also a futurist working as Principal Analyst at Altimeter Group, a Prophet company. You can purchase X on Amazon and visit the book site for more information and to see other reviews. San Francisco Serendipity: While recently meeting with my Cousin at a cafe in SF for the first time in 40 years, my friend Chris Heuer walked by on his way to see our mutual friend Brian Solis, where we ended up taking this photo (at the Four Seasons of course). Interesting thoughts about human centered designs. Not enough of that in the online marketing world!